"This is not an endorsement"
Interesting thing here is the fact that the Heart and Stroke Foundation not only know it's an endorsement they in fact brag about it. "The Health Check symbol complements mandatory nutrition labelling, in a 2004 research study, sixty-five percent of consumers recognized the Health Check logo as meaning the food is 'nutritious', 'healthy', 'good for you' or 'approved by the Heart and Stroke Foundation.' Sixty-eight percent agreed with the statement: 'I can rely on Health Check to help me make healthy food choices." And how about her views on burgers specifically? So in fact the Heart and Stroke Foundation markets their Health Check as something that let's consumers know that a food is "nutritious", "health", "good for you" and "approved by the Heart and Stroke Foundation". You might even say they market their Health Check as something product manufacturers can put on their foods to sell more of them....sort of like an, what's that word again, ENDORSEMENT. 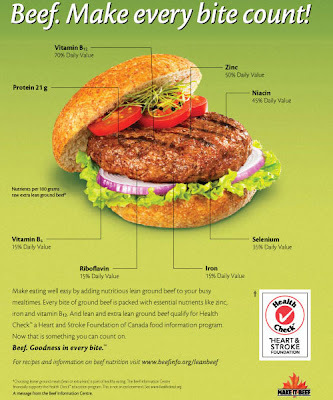 "Given a choice, most of our customers would choose a Health Check labelled product over one that doesn't have that designation"
Now back to beef - so that World Cancer Research Fund Report just came out - maybe Carol and the Heart and Stroke Foundation didn't know that red meat wasn't good for you and now they're going to take back that Health Check. Of course, were it to be true that this is the first they're hearing that red meat's not a healthy choice it would reflect not a lack of research as the most recent report merely summarized existing literature, it would instead reflect either a lack of understanding of the research, a lack of reading of the research or a lack of caring about the research. Unfortunately, none of those are really heartwarming options. What it comes down to is the following question, is recommending something because it's not as bad as alternatives in its class a good idea? Certainly my thoughts when it comes to folks like the Heart and Stroke Foundation should be an unequivocal, "NO!" To falsely promote slightly less unhealthy foods as being good for you is just bad medicine and given that the HSF themselves state consumers who see their Health Check think, "the food is 'nutritious', 'healthy', 'good for you' or 'approved by the Heart and Stroke Foundation", I think it's unethical to boot as the HSF knows that their check lulls consumers into thinking that the food is good for them, not that the food is less bad for them than others like it. So anyone want to take bets on whether or not Health Check rescinds its endorsement of red meat? Can you guess what answer my money's on? And speaking of money, stay tuned tomorrow when I discuss just how much money Health Check makes and how that's likely to influence both their recommendations and their ability to change them.